← Small ODROID-U3 platform coming out ! I was looking for a system able to work with an iPhone (Bluetooth Low Emission – LBE) and a standard android (Standard bluetooth / rfcom). The RFDuino Arduino platform I have is perfect for BLE so, I decided to add a HC-05 module for the standard bluetooth. Here is the description on how to make it ! HC-05 bluetooth shield need to be initialized the first time. I don’t want to detail because there is another article on HC-05 and a lot of documentation on this component online. But the main issue to manage is to be able to do this configuration online once on the first startup. This means we are able to store in the RFduino we already have make the configuration. The good thing is that we are able to write into the flash from the arduino code and store a flag to indicate that it has been done. My flag is the version, so if I upgrade the rfduino with a new version of code I will reconfigure the hc-05. (as this new version could change the configuration). The second issue to manage is the software reset : once the hc-05 is configured, both rfduino and hc-05 have to be restarted to take the configuration into account. This can be done for the two calling the right reset function. sendHC05AtCmd("AT+CLASS=40500",true);       // this bt device type ?? RFduino and HC-05 are working differently. RFduino is using callback function working with interrupts, Serial port, basically works with polling. To simplify my code I chose to work in ASCII mode with both. HC-05 uses lines (finishing by “\r\n”) LBE mode uses byte array. 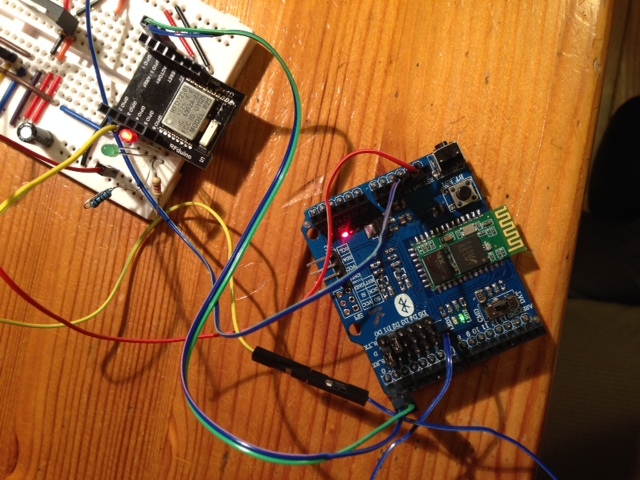 This entry was posted in Hardware and tagged arduino, BLE, bluetooth, rfduino. Bookmark the permalink.